This page contains all the information you need if you’re planning to visit our offices in Southwark, London. If you think of further information that would be useful here, please let us know. Thanks. See the map on Google Maps online (opens new window). Here are some photographs of our office. Inside the reception area, there is a green sign saying ‘Vivo South Bank Central’ which is visible from the road. Photo of our office entrance taken directly outside. The Vivo sign inside is highlighted with a red ring. The entrance on Stamford Street has large automatic sliding doors which are wide enough for all wheelchairs including power assisted ones. The pavement outside is level, and does not have a gradient. Our office is step free and accessible to wheelchair users. We are located on the first floor which is accessible via a lift, and both our office and meeting rooms are all step free. There are accessible toilets on the first floor. Dogs are welcome in our office. If you require a bowl of water for your dog, please ask us. We have a portable Hearing Loop that we put into any meeting room or space in our office and take to focus group sessions when we travel. Thank you Andrew from Contacta! Unfortunately, the building does not have a hearing induction loop system at the reception. If you are deaf or hard of hearing and there is anything further we can do to make your visit easier, please let us know. The communal area can become quite noisy if there are lots of people there. Dogs are welcome, and so on occasion, they can be noisy and bark etc. The reception desk is low and is accessible to wheelchair users. The reception area has high lighting levels. When you enter the building, there is a reception desk located in front of you, to the right. The reception staff will already have been informed that you are coming to the office, so just give them your name. To get to the first floor, the security guard will let you through the electronic gates until you get to the lifts. The lifts are operated by a touch screen panel; tap any of the screens, and a menu will be displayed. 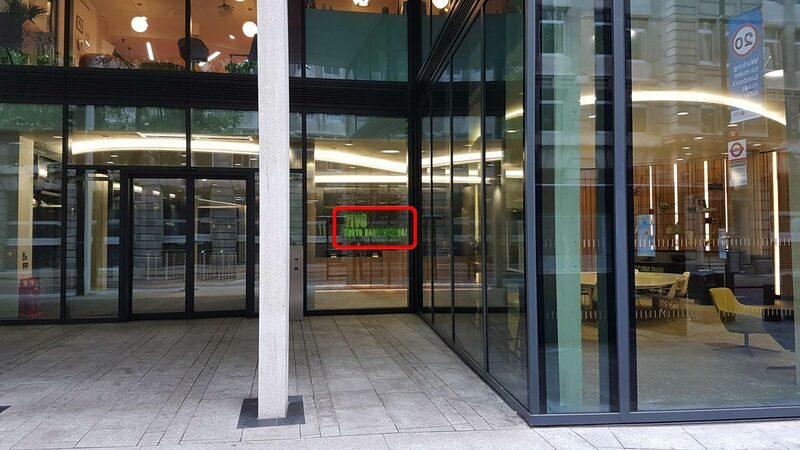 Select ‘Floor 1’ and the screen will inform you which lift to take. There are 4 lifts available which are identified by letters (e.g. lift 1 is ‘A’, lift 2 is ‘B’ etc etc). If you are require assistance, the security guard can assist you. Please note that the lift does not announce each floor number as it arrives. However as our office is on floor 1, we will always be the first stop. When you arrive at floor 1, walk through the glass double doors and go to reception which is on the left hand side. Once you have done this, you can wait in the communal area until someone from Open Inclusion comes to meet you. 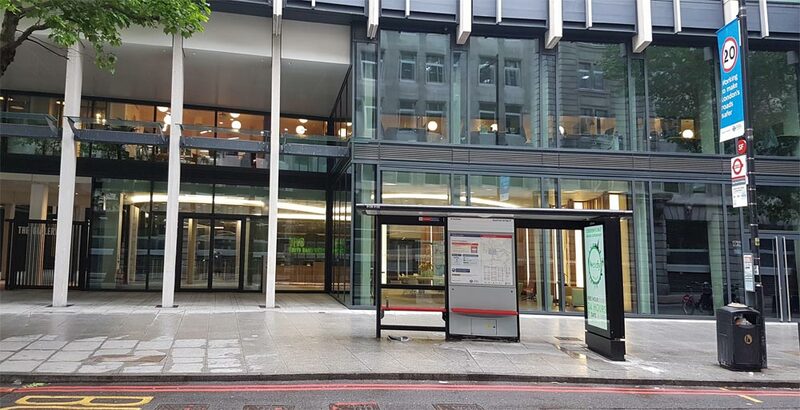 If you have any additional accessibility requirements, and would like someone to come and meet you on the ground floor in our building or at either Blackfriars rail or Southwark underground station, please let us know before your meeting, so that we can ensure someone is available to greet you. The Blue Badge Parking website displays useful information on the location of parking spaces for blue badge holders. The map below displays nearby blue badge parking spaces, indicated by a blue pin. The red pin displays where our office is located. Location: As you step off the bus, turn right until you get to the pedestrian zebra crossing. Cross the road, turn to your right and walk approx 20 metres. The office will be on your left hand side. Location: From the bus stop, turn left and walk on Upper Ground for approximately 100 metres, then take the second right into Hatfields. Walk along Hatfields for a further 100 metres until you arrive at the junction and then turn left. Walk for approximately 20 metres and you will arrive at the office on your left hand side. Please note there are two entrances/exits from Blackfriars rail station, as the station sits across the River Thames on a bridge. We are closest to the south side. Please note that the Circle and District lines of London Underground also serve Blackfriars Underground station which is located at the northern exit of Blackfriars railway station. Blackfriars station map showing exits on both sides of the River Thames. Both the North and South entrances of Blackfriars Station are step free, with lifts from street level to the platform. There are ramps available to board the train from the platform although you will need to ask staff to assist you. When you are at the North exit, cross the road so that you are on the opposite side, and turn left to cross Blackfriars Bridge. When you reach the other side of the river, walk a further 170 metres until you reach the junction with Stamford Street. Turn right down Stamford Street and continue approx 150 metres. The office will be on your right hand side. When you are at the South exit, turn left and walk along the river path. Continue under the bridge, and past the Doggetts pub on the left, and take the next left into Marigold Alley. Continue to the end of the alley, then turn left into Upper Ground and take the first right into Rennie Street. Continue to the end of Rennie Street, then turn right into Stamford Street. The office is located approx 70 metres ahead, and will be on your right hand side. Map showing the walking route from the northern exit of Blackfriars station. Map showing the walking route from the southern exit of Blackfriars station. The Waterloo Road and Station Approach exits are both step-free. The South Bank and Victory Arch exits both have steps. There are ramps available to board the trains from the platform although you will need to ask staff to assist you. Leave the station via the Jubilee line/Waterloo Road exit. Once outside the station, cross the road using the pelican crossing, and then turn left and continue along Waterloo Road. When you reach the BFI roundabout turn right onto Stamford Street. Continue approximately 500 metres along Stamford Street and cross the road at the zebra crossing (note: there is a zebra crossing before this as well, but you need to use the second one). The office is located in front of the zebra crossing. Map showing the walking route from Waterloo and Waterloo East stations. Waterloo East is connected to both Waterloo (Main) railway and Southwark underground stations. There is a step free route from Waterloo but the interchange with Southwark is not step free. There is step free access from Waterloo station to the Waterloo East platforms via a lift and sloping ramps. The entrance to this interchange can be found on the balcony level (1st floor) at Waterloo station. There are ramps available to board the trains from the platform although you need to have booked this service with the train provider at least 24 hours in advance. There is no step free access between Southwark and Waterloo East. Use the interchange to exit via Waterloo station. Leave the station via the Jubilee line/Waterloo Road exit. When you exit, cross the road using the pelican crossing, and then turn left and continue along Waterloo Road. When you reach the BFI roundabout turn right onto Stamford Street. Continue approximately 500 metres along Stamford Street and cross the road at the zebra crossing (note: there is a zebra crossing before this as well, but you need to use the second one). The office is located in front of the zebra crossing. The route map is the same as for Waterloo station above. The station is step free from street to tube train via a lift. The lift is located to the left of the main entrance. When you exit the station, turn left on Blackfriars Road and continue until you reach the crossroads with Stamford Street. Cross the road using the pelican crossing, and turn left down Stamford Street. The office is located approx 150 metres ahead on the right hand side. Map showing the walk from Southwark underground station. The Jubilee line has step free access from the tube train to street level and concourse level. The Bakerloo and Northern lines require passengers to use escalators and stairs. Note: This walking route and accompanying map are the same as from Waterloo railway station above. Leave the station via the Jubilee line exit (Waterloo Road). When you exit, turn left on Waterloo Road and at the BFI roundabout turn right onto Stamford Street. Continue approximately 500 metres along Stamford Street and cross the road at the zebra crossing (note: there is a zebra crossing before this as well, but you need to use the second one). The office is located in front of the zebra crossing. Both the Circle and District lines have step free access via a lift to and from platform level, however there is a gap/step between the train and the platform. When you exit the tube station, cross the road so that you are on the opposite side, and turn left to cross Blackfriars Bridge. When you reach the other side of the river, walk a further 170 metres until you reach the junction with Stamford Street. Turn right down Stamford Street and continue approx 150 metres. The office will be on your right hand side. The map of the route is the same as if you were coming from the northern exit of Blackfriars railway station – see above. There are bike racks located outside the Little Waitrose on Stamford Street, approx 50 metres from our office. There is a Santander cycle docking station (Malroy Walk) which is located outside the front of the office, less than 1 minute walk away. The docking station has space for 29 cycles. If you have any questions about your visit please contact the person you’re due to visit, and they’ll do their best to help you.